A recent New Yorker article by Alex Ross suggested that the resurgence of interest in vinyl LPs is simply 'a modest rebellion against the tyranny of instant access' among younger listeners. Maybe; or perhaps the pin-sharp hearing of those younger listers has identified what many older ears have known for a long time, namely that something important was lost when the musicality of the vinyl disc was traded for the portability of digital files. Whatever the reason, vinyl is certainly bouncing back. The photos above and below were taken by me recently in a large hypermarket outside Caen in northern France. The E.Leclerc chain of hypermarkets is opening Espace Culturelle - cultural spaces - in its major stores. These offer a mouth-watering range of music, video and book merchandise, the like of which would never be seen in a UK supermarket. 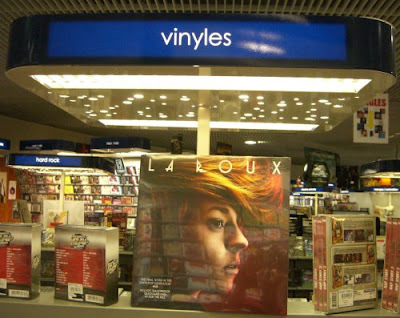 Pride of place in the new Espace Culturelle are gondolas of 180gm vinyl pressings of rock music selling at a premium over the CD equivalent. 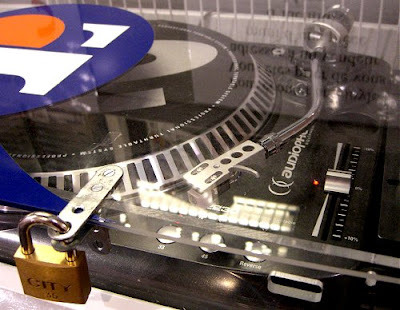 Above is the turntable available for auditioning in-store, complete with padlock; below is a general view of the vinyl display. We visited the hypermarket in Caen on the last day of our six week trip to France. My music budget was already well over-spent, and we were only there for a baquette and coffee lunch before catching the cross-Channel ferry home. So I avoided the tempting vinyl, but ended up buying 23 CDs, all with vinyl connections. One was the Classic Labor Songs disc that featured in a recent post, found in a discount bin for 2 euros. 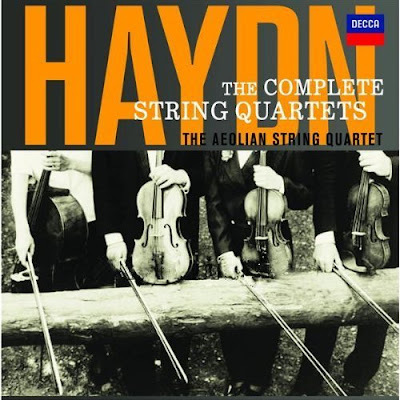 The other 22 were the 'limited edition' Decca re-issue of the complete Haydn String Quartets played by the Aeolian Quartet seen below, which was discounted to 49 euros. Listening to this wonderfully inventive and forward-looking music really shows how wrong we are to categorise Hayn as a 'safe' composer. Joseph Haydn may not be neglected today, but he is certainly misunderstood. The Aeolian's Haydn Quartet cycle was recorded in analogue sound between 1973 and 1976. Back then vinyl was still the pre-eminent playback format, and the Compact Cassette (remember that?) was merely a low-fi option for sound on the move, rather like MP3 today. The sound from the CD transfers of the Haydn is truly astonishing; there is an immediacy and body to the string sound that is rarely heard in more recent recordings, even when SACD and other miraculous technology is invoked. For similar affordable examples of revelatory string sound try the augmented Grumiaux Trio's complete Mozart String Quintets and the complete Mozart String Trios and Duos from the same period. Why is the string sound from those 1960s and 70s recording so vivid? Is it because, as a violinist friend suggests, string playing techniques have changed over the last three decades, resulting in today's leaner sound? Maybe, but I have a theory that changes in the microphones used for the recordings over the years account for much of the difference between the sound of 'great' records of the past, and today's more analytical but thinner sounding offerings. Microphones such as the classic Neumann U-47 and U-48 starting disappearing from studios in the late 1960s when the valves (vaccum tubes) they used stopped being manufactured. The solid state microphones that replaced them were more durable and easier to set up. So who worried about what they sounded like? As invariably happens paths now converge, and there is a fascinating connection between the Aeolian Quartet's Haydn recording, the Neumann U-47 microphone, and the vinyl rock classic seen above. A connection which, I hasten to add, is not discussed in the rather po-faced notes in the Decca Haydn box. Derek Simpson was the long-standing cellist of the Aeolian Quartet. In 1966 he was one of the session players who made up the string octet on the Beatle's groundbreaking Eleanor Rigby. Among the other players were Jurgen Hess, leader of the English Chamber Orchestra, Steven Shingles, who played viola in the Academy of St Martin in the Fields, and Sidney Sax, who co-founded the National Philharmonic Orchestra whose recording of Howard Hanson's Second Symphony featured here in 2005. 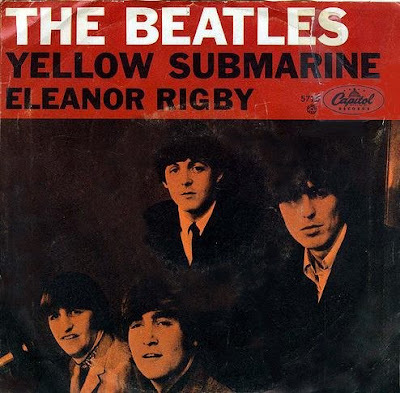 The crucial string backing for Eleanor Rigby played by this distinguished group of session musicians was not written by the Beatles, but instead was scored by the 'fifth Beatle' George Martin. And producer George Martin's favourite microphone, which he used on many Beatle's recordings, was the Neumann U-47. Can you tell the state of a nation by the quality of its bookshops? I should have mentioned that The Seven Last Words in the Aeolian's Haydn box are interspersed by Peter Pears reading from John Donne, Edith Sitwell, Edwin Muir and others. Alas this 'limited edition' re-release no longer seems to be available. Perhaps Universal Music are holding it back for the 300th anniversary of Haydn's death in 2109? Not apropos of this blog in particular, but I just had to jot a note to say how much I am enjoying On an Overgrown Path. I am not a professional musician -- can't even read music -- but I love "classical" music and am loving having my horizons expanded by your blogs. I have been trying to educate myself about music for 30+ years; my primary means of learning through the '80s was a subscription to Gramophone -- perhaps a bit of a backdoor portal for an American, but there you have it. Now continued by you ... and my long-standing affinity for Britten certainly finds resonance in your posts about Aldeburgh, Norwich, and the other places near your home. Just wanted to express my gratitude. Thanks for this post. I'd never realized microphones had changed along with everything else. Getting good sound on a recording is as much of an art as making the music, but much less studied and commented on. At least in making music there's the physical instrument to talk about, but the sound is harder to talk about because there's no physical aspect to build on. It also seems to me that there's a wider variance in how different people hear than is recognized, due both to genetics and previous experience. In addition to changes in microphones and electronics, I also suspect that microphone placement and mixing practices have changed substantially during the last few decades. But I'm not really competent to say one way or another if practices like near field recording, digital multitrack with dozens of tracks, changes in room treatment, changes in postprocessing etc are responsible or not. Certainly, so many "special" qualities exist in the recording equipment of that time that any attempt at exactly matching the sound of the era is probably going to fail. And I have to wonder how much different tastes in mastering style in classical music have changed since, eg, von Karajan's golden years. In the rock field, one might compare the sound of Pet Sounds to Brian Wilson's 2004 SMiLE (claimed to have been produced with 1960s production practices) and observe the differences. Yes, it has all changed obviously. Mics, preamps, placement, mixing boards, playing styles... it has all changed. Richard Tollerton, above, also mentions the rooms. In one famous story Berry Gordy of Motown took some of his musicians to record in a state of the art studio in Chicago instead of what they pieced together in Detroit in the label's early years. One of the things he realized was that part of the "Motown Sound" was the room itself. Those Chicago recordings were subsequently ditched in favor of a second session in the acoustically inferior Detroit studio where Motown tracked everything early on.